Get away from the fear. 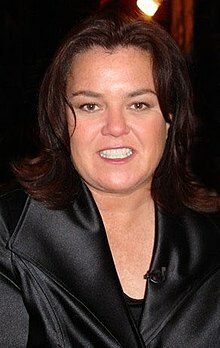 Roseann "Rosie" O'Donnell (born March 21, 1962) is an eleven-time Emmy Award-winning American television host, stand-up comedian, actress, and author. Get away from the fear. Don't fear the terrorists. They're mothers and fathers. President Bush almost killed me. You know, you can imagine in China it's like: "Ching chong, ching chong chong, Danny DeVito, ching chong chong chong, drunk, 'The View,' ching chong. Chung, L.A. (16 December 2006). "'Ching-chong' joke spreads ignorance". San Jose Mercury News. Retrieved on 2010-11-09. O'Donnell using the pejorative term ching chong to describe Danny Devito on The View. But I'm also gonna give you a fair warning that there's a good chance I'll do something like that again, probably in the next week -- not on purpose. Only 'cause it's how my brain works. Hua, Vanessa (15 December 2006). "O'Donnell apologizes for Chinese parody / But comedian warns she is likely to spoof languages agai". San Francisco Chronicle. Retrieved on 2010-11-09. O'Donnell's apology after using the pejorative term ching chong.